ELDREDS PATRICK KEAN looks for a teammate to pass the basketball to after grabbing a rebound in the third quarter of Tuesday nights game versus Fallsburg. Watching Kean are Fallsburgs Danny Friedman (32) and David Anthony, center, as well as fellow Yellowjackets John Scully and George Fountain (far right). ELDRED  February 24, 2006  The Fallsburg Comets used a 22-9 scoring run in the third quarter Tuesday night to record a 69-56 victory over the host Eldred Yellowjackets in a non-league game. Fallsburg finished its 2005-2006 season with a 4-15 record, while Eldred ended the season at 5-13. Eldred rallied in the second quarter to narrow the Comets eight-point lead down just three points (32-29) at halftime. But Fallsburg outscored the Yellowjackets 11-5 in the first four and a half minutes of the third period to take a 43-34 advantage. The Comets lead grew to 13 points (51-38) when senior forward David Anthony stole the ball near halfcourt and sprinted downcourt and dunked the ball with just 30 seconds remaining in the quarter. Twenty-seven seconds later, Fallsburgs Victor Leventritt made a 3-point shot to give his team a 54-38 advantage entering the final eight minutes of play. Anthony, who made a pair of 3-pointers, finished the night with a game-high 27 points, while Chris Gates and Adam Gold each scored 13 points for the Comets. Harris Seletsky netted seven points and Danny Friedman added six points for Fallsburg. It was good to end the season on a positive note, Fallsburg Coach Paul Marsden said. We played as a team for all 32 minutes tonight. Harris Seletsky had his best game of the season tonight, Marsden added. The veteran coach praised all of the Comets seniors  Anthony, Danny Friedman, Leventritt, Gates, Gold, Jon Nardi and Seletsky  for all of their hard work and dedication this year and in past seasons. Sophomore guard John Scully paced the Yellowjackets offense by scoring 19 points. Six of his points were the result of a pair of successful shots from beyond the 3-point arc. Tyler King netted 11 points for Eldred and teammates Mike Prunka and Chris Leader added seven and six points, respectively. Eldred Coach Joe OConnor said that the key to the game was that the Comets played some great defense in the second half. You just have to give Fallsburg credit for its outstanding job on defense, he said. Like Marsden, OConnor will miss the contributions of seven seniors next season. Those seven Yellowjackets are: George Fountain, Patrick Kean, King, Nick Klufas, Prunka, Jake Smith and Tony Van Zanten. 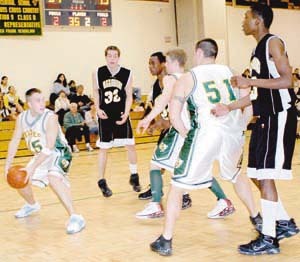 But OConnor said that sophomores Leader, Scully, Kojo Williams and Robert Moriggia  who played on the Eldred junior varsity team this season  should be a great core of players for the Yellowjackets 2006-2007 varsity basketball team.